How do I send an SMS (or MMS) message and have it appear on Google Buzz? I can do this with Twitter, Facebook, or my blog but I can’t figure out how to do it with Google Buzz! Update, 19 February 2012: Google Buzz no longer exists. Use Google+ instead. Google+ natively supports posting and receiving notifications by SMS. Update, 28 May 2010: With the advent of the Google Buzz API, someone has set up a Buzz via SMS application on Google App Engine. This is a more direct solution, except that it does not support MMS (posting images or videos). The workaround below is a more indirect method, but it does support MMS. Google Buzz does not directly support SMS or MMS posting, but there is a workaround that works quite well, although it’s perhaps a little tricky to get set up in the first place. I don’t really know why Google Buzz does not directly support SMS posting, since Google uses SMS for so many other things already. Perhaps it’s to try to encourage longer, more content-oriented posts to differentiate itself from Twitter and Facebook. That’s one of the aspects of Buzz that I really like, but it’s still annoying not to even have the option to post via SMS. I suspect Google will implement this feature eventually, but for now here’s how you can get the same effect. The idea behind the solution is simple: since Buzz can pick up posts from almost any public source, you post via SMS to another public site, and have Buzz pick those up and put them into your Buzz stream. You can do this without any setup if you, for example, post to Twitter via SMS and then hook your Twitter posts into Buzz. But there are two problems with that: First, you may not want everything that goes to Twitter to also go to Buzz, and second, tweets in particular seem to take a very long time to show up in your Buzz stream (on the order of hours). The following method allows SMS Buzz posts to be separated from tweets and to show up almost instantaneously. That’s it! Now post to the “SMS to Buzz Gateway” blog via SMS, and your messages will show up in your buzz stream within a minute or so! Step 2, using FeedBurner, is technically optional, but it does seem to significantly reduce the delay between posting a message and having it show up in Buzz. The same setup without FeedBurner seems to have a delay of at least 15 to 20 minutes, rather than a minute or two, before the post shows up in Buzz. That’s still a lot better than the hours of delay for tweets, but faster is always better, and FeedBurner is easy. Just make a fresh new blog on any public blogging service that supports SMS posting and RSS or Atom feeds (this is pretty much all of them). I used Blogger, but you could use WordPress or whatever you want. Set up the blog to allow your cell phone to post via SMS and/or MMS. How to do this depends on which service you are using. I would also recommend turning off comments and adding a notice to the blog as to what it’s for (possibly with a link to your Buzz stream) just in case someone stumbles onto it and becomes quite confused. First, if you don’t have a FeedBurner account, go create one. Then, find out what your new blog’s RSS or Atom feed URL is: Find the link on the blog’s front page that says “RSS Feed” or “Atom Feed” and copy the URL that it links to. Log in to FeedBurner and choose to “Burn a Feed”. Paste in the URL you just copied, and “burn” it. All of the default options should be fine. Select a reasonable name for your feed, and note the http://feeds.feedburner.com/yourfeedsname URL. Go back to your Blog, and in its settings tell it to use the feedburner feed you just created instead of its raw RSS or Atom feed. In Blogger, there is a special built-in option for this. In WordPress, you have to install a plugin (I use this one for Nerdland). XFN is the XHTML Friends Network, and it is what Google Profile, and by extension Google Buzz, use to determine which pages (and their corresponding RSS or Atom feeds) belong to you. These then show up as options for “connected sites” in Buzz. You need to link your new SMS Gateway blog to your Google Profile using XFN, and this link must be bi-directional. 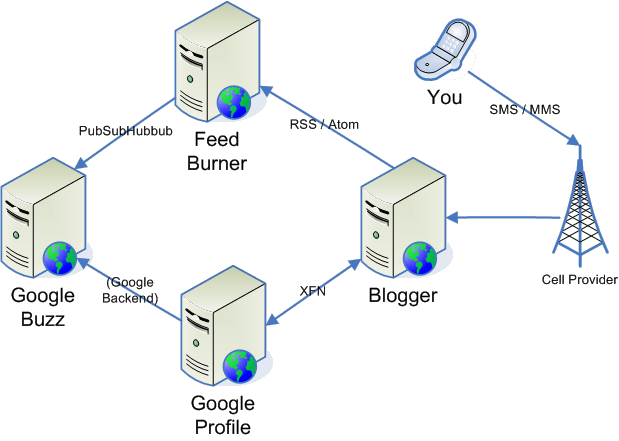 In other words, your SMS Gateway blog must have an XFN link to your Google Profile that says “this is my Google Profile”, and you must also go into your Google Profile and say “this is my blog”. The link text can actually be anything you want; the important part is the rel="me" attribute. Be sure that the link points to your Google Profile. Again, be sure that the href attribute points to the correct URL for your Google Profile. Either one of these will be considered by Google as an assertion by the blog that the linked profile is that of the owner. This step is comparatively easy. Log into your Google Profile, and edit it. Scroll down to the links section, and add the URL to the front page of the blog you just created (you may in fact already see it listed as a suggestion!). Make sure that when you add the link you do check the box that says “This is a profile page about me”. This is an optional step, but if you’re impatient, go to the Google Social Graph Recrawl Tool and if the “claims Google profile” column next to that blog you just created is not checked, press the corresponding “Recrawl” button. It should mention that it added an “edge” and return you to the previous page with the “claims Google profile” field checked. Finally, go to Google Buzz, and click on the Connected Sites link. The blog you just created should now show up as a site that you can connect to Buzz (if it does not, just wait a few minutes and it will). Once you connect your SMS Gateway blog to Buzz, your SMS posts will show up in just a minute or two on Buzz! implemented using your very valuable idea. Thanks so much, and if you have any suggestions / comments / remarks, please do let me know. does this only work in USA? I think the phone-to-blog sms part doesn’t work in the UK.